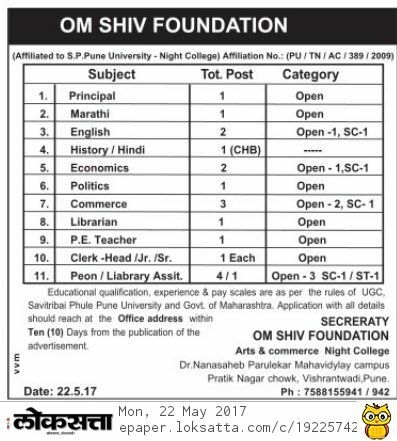 Om Shiv Foundation (Om Shiv Foundation), Pune Published Job Notification for 22 Principal & Teacher In Different Subjects & More Posts. Candidates who wish to apply must look at Om Shiv Foundation Recruitment 2017. Eligible candidates can apply online before 10 days of publication. Interested & Eligible candidates can send their application along with all the necessary documents and testimonials to Security, Om Shiv Foundation, Arts & Commerce Night College, Dr Nanasaheb Parulekar Mahavidylay Campus, Pratik Nagar Chowk, Vishrantwadi, Pune. Starting Date, Last Date to Apply Offline at Om Shiv Foundation which candidates should be remember as follows. Start Date to Apply Offline: 22-05-2017. Last Date to Apply Offline: 10 Days of publication.